We are generally value investors. Our bread and butter is investing in closed-end funds. I have personally been investing in closed-end funds for thirty-five years. However, we have also invested opportunistically in a number of other areas. In certain instances, we have employed activism to unlock the value of our investments. Unlike many other managers who are tethered to a benchmark, we are not interested in making an investment unless we perceive that we can get an edge. After the tender offer, we intend to apply this “edge” philosophy to managing the Fund. We purchased most of our shares of these well diversified multi-manager equity funds at a double-digit discount to net asset value. Each fund makes cash distributions of 1.5% per quarter (6% per annum). After extensive discussions with the manager about their discounts, on June 26th ASG launched a self-tender offer for 25% of its shares at a 5% discount to NAV. As a result, the discount narrowed to under 8% and we opportunistically sold some of our shares before the tender offer expired. We tendered the balance and the Fund accepted almost 80% of our shares, a surprisingly high percentage. Since we saw a low probability of further alpha by holding, we subsequently sold our remaining shares of ASG in the market at a single-digit discount. USA’s discount, on the other hand, is still greater than 10% and therefore we have continued to accumulate shares. We intend to resume discussions with management about USA’s discount in the near future. Besides the example above the same semi-annual report provides plenty of other examples of investments the company is making, the rationale for making them, and what they are doing to unlock value. So unlike most closed-end funds I think there is a good probability that they are indeed creating value. Having a track record is good: doing something that logically makes sense is even better. …on July 23, 2012 the Fund finally completed an innovative rights offering for a new class of convertible preferred stock at a price of $50 per share. The offering was significantly oversubscribed. The aggregate number of shares issued was 749,086 for which the Fund received a total of $37,454,300 in cash. The converts have been trading slightly above the issue price and we think that is an indication that we got the terms about right. To summarize the basic terms, each convert (1) is entitled to receive a quarterly dividend of $0.375 per share or 3% per annum; (2) is convertible into 3 shares of common stock (subject to adjustment for distributions); (3) will be redeemed in five years at $50, and (4) is callable if the net asset value of the common stock reaches $20 per share (subject to adjustment for distributions). To be honest: I don’t understand why the convertible preferred stock was created. It seems to be unnecessary complex without significant upside for the common. While all the downside remains with the common the upside is shared almost completely with the preferreds. The flip side of this story is that the preferreds are already callable if NAV grows with just 10%, so it could easily be that they will be called within a year. So why increase the size of the funds assets in such a temporary and volatile way? The latest reported NAV/share of SPE is $17.68/share while the common shares are trading at $15.81 and the preferreds at $52.00. This means that the common is trading at a bit more than a 10% discount, and it is possible to buy the common without almost no downside risk at $17.33/share. You don’t know how long you don’t have no downside risk since the preferreds are callable at a $20 NAV/share, but unless SPE starts trading at a huge discount this is always a favorable outcome. And while waiting for this positive scenario you will be paid $1.5 in interest a year and you know that no-matter what: you will be repaid at par in 5 years time. To properly evaluate the value the preferreds you need to create a Monte Carlo simulation. The reason for this is that the path that the asset value takes is very important for the value of the preferreds. You could have two scenario’s where after five years the total growth in NAV is zero, but if in one case NAV briefly hit $20/share in the first year the preferreds will be (or should be) called early while in the other case the preferred owner is going to enjoy five years of interest. Since I hadn’t programmed anything in a long time this seemed like a fun exercise. I have modelled the growth of the asset value using geometric Brownian motion. This basically means that the value takes a random walk with a certain drift (the expected growth rate) and a certain variance (I used the historical variance of SPE for the past year). The key part of the simulation, written in Python, is listed below and should be fairly straight forward to understand even if you aren’t a programmer. The full source code of the program can be found here if you want to play around with different assumptions. Simulation results are written to a .csv file that you can open in Excel. Technically geometric Brownian motion is not completely correct to describe asset prices because it assumes constant variance and uses a normal distribution, but it’s a reasonable approximation to get an idea of the range of outcomes. 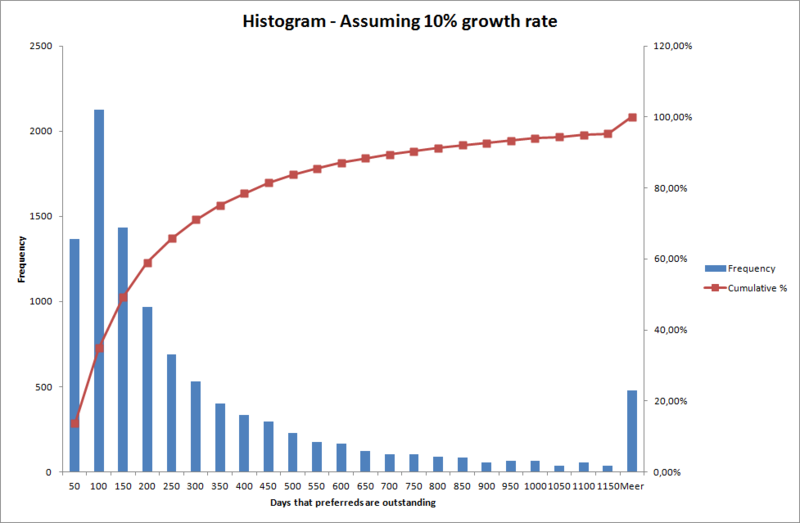 Besides the variance a key input of the simulation is what you think the expected growth rate of the asset base is. The lower it is the higher the probability that the preferreds will not be called, and the higher the relative attractiveness of the preferreds. 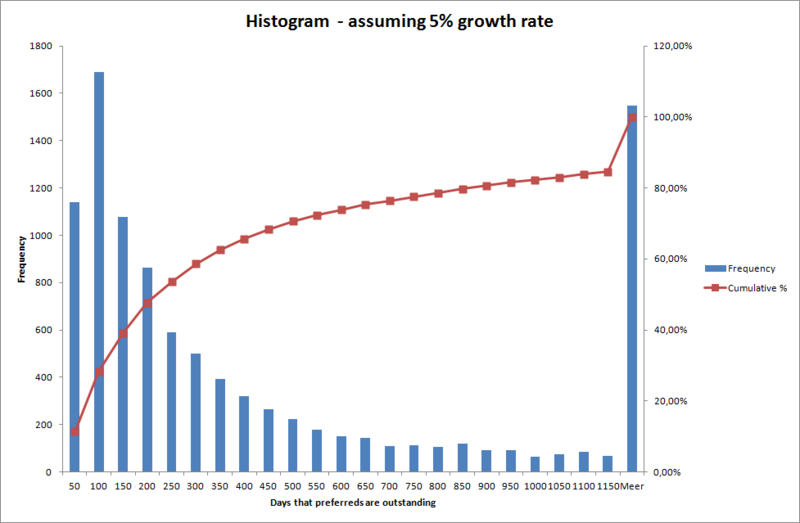 As you can see the higher the growth rate the shorter the average number of days the preferreds remain outstanding. If the preferreds remain outstanding longer than 773 days (a bit more than three years, using 252 days/year) they will always outperform the common. The reason is that you can buy three shares using the preferreds at $52 or three normal shares at $15.80 each. The $4.60 price difference is roughly equal to three years in interest payments. 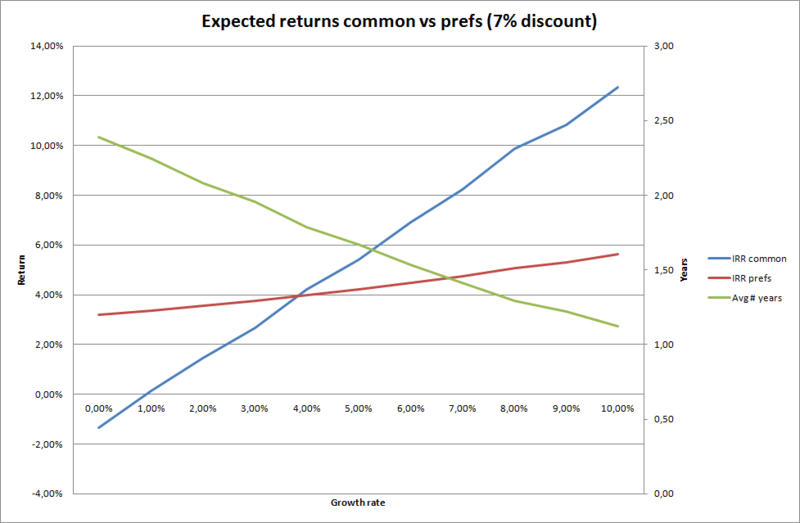 On average the preferreds are expected to underperform the common because even with just a 5% growth rate the preferreds will be called within three years ~78% of the time and with a 10% rate the probability goes up to 90%. This is obviously not the complete picture: it also matters how much the preferreds underperform or outperform in the various scenario’s and how much risk they have. The following graph should provide some insight into this question. What you see here are average annualized returns weighted by the number of days before the preferreds are called. While the preferreds are extremely low risk you are also not getting a great return. The reasons for this are: 1. the preferreds are trading above par, 2. when the preferreds are called NAV/share is diluted and 3. I’m assuming that after the conversion the common is still trading at a 10% discount. You do get an option on the discount of SPE shrinking with the preferreds because how valuable the conversion is depends on the discount of the common while the callable date depends on the underlying NAV. I do think that relatively speaking the preferreds are a good deal. There is a huge amount of excess collateral, and if this would be rated it probably deserves an AAA-rating. And a return of >2% a year for debt with a maturity below five year, and most likely around one year is a good deal. And you do get an option on the discount shrinking as well. I just don’t find it attractive from an absolute return perspective. 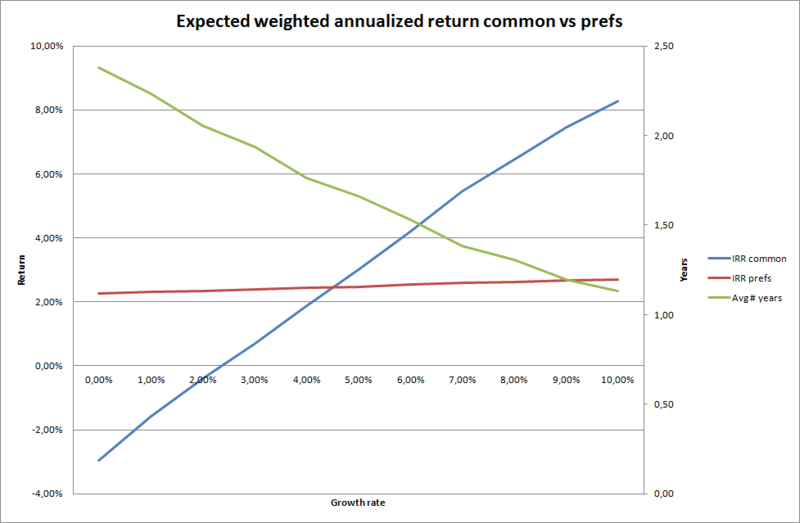 One thing about the returns of the common in the above graph that should catch your attention is that the weighted average IRR is lower than the underlying growth rate. For returns below 3% this is logical: here the assets don’t return enough to service the dividends for the preferreds, so you do have leverage to the downside. The real problem is that the conversion of the preferreds dilutes common shares. If NAV grows with 10% from 158M to 174M the preferreds are callable because (174M – 37M) / 6.809.867 > $20. But if this happens you have 174M in NAV and 6.809.867 + 749.086 * 3 = 9.057.125 shares. This would result in a NAV of ~$19.20/share, and with a 10% discount you have a value of $17.30 remaining. With the stock at $15.80 today the 10% growth in NAV would result in a return of ‘just’ 9.4% for common shares (this is ignoring any dividends that are paid in the time it took to generate this return). At first sight it’s a weird result: but I think the discount is the key to understanding what is happening. The current discount should already account for the highly likely future dilution, and when the preferreds are converted the discount should shrink. By assuming that the discount remains constant – at first sight a reasonable assumption – you are effectively assuming that it is growing. This should boost the expected returns of both the preferreds and the common stock. In this case both the returns of the common and the preferreds are higher. The common does have leverage to both the upside and the downside, and the preferreds are a bit more sensitive to the underlying growth rate. The expected return of the preferreds is no longer an almost flat line. If there is one thing to take away from all my ramblings: at today’s prices you are not truly buying SPE at a 10% discount. Part of this discount (my guess: ~3%) is simply representing the possible future dilution from the preferreds, and because these are trading above par they don’t offer an easy way to profit. SPE or SPE-P might still be an attractive investment: in the grand scheme of things a discount that is a few percentage points bigger or smaller is no big deal. And while I have talked little about my perspective on the cost structure of SPE or their strategy in this post (it is already long enough as it is), I do mostly agree with The Brooklyn Investor and Whopper Investments about the attractiveness of the fund. This entry was posted in Research and tagged SPE, SPE-P on October 3, 2012 by Alpha Vulture. Wow – great post! I’ll be reading this a couple of times to fully grok it. Nice find on the “true” discount – I wouldn’t have had any way of figuring that out. You don’t need a high level analysis to reach that conclusion. If you see that the preferreds are trading above par the only conclustion can be that the common is worth less than par (NAV) if you assume that the prefs are priced correctly. You do need a bit more analysis to get the details right. I have several concerns about SPE. 1-they don’t hedge their positions in CEFs. So they do not solely bet that the discount will shrink, but also rely on luck as well. They recently lost money on New Ireland fund because they did not hedge at all. 2-they tend to keep the warrants from the SPAC IPOs. I found it annoying because SPACs tend to perform horribly after a merger deal is finished. (3) I don’t know whether they cooperate with other activists in CEF world, e.g. City of London Investment Management. 1. Think this is a matter of risk preference: do you want alpha + beta or alpha – hedging costs? I would prefer the first option, and yes that can result in a discount shrinking and NAV dropping faster, but in the long run it should perform better. 2. Don’t have a real opinion on this. Think they see the warrants mainly as some free upside if a deal goes through. Why should SPAC’s perform horribly after a merger deal is finished? 3. Think they do. If you read their annual reports you notice that they are not always acting alone. I read that they do cooperate, but I suspect that they don’t communicate with city of london investment at all. Bulldog recently bought 5% of greater china fund and seems to support a merger with JF China. But City of London which holds 40% Greater China Fund is sure to oppose such a merger as the merger terms are unfavorable to them. A lot of short-term investments will in the long run give you market returns, altough each individual investment should be expected to be almost flat on average. I’m fine with this part of their strategy, although hedging and adding some leverage also make sense. Not sure how effective that can be done in a CEF? About the SPAC’s: shouldn’t this then not already be incorporated in the price of the warrants? Since they recently issued preferred shares, I suppose they wanted to add more leverage. Then it makes sense to me to lock up the spread rather than engaging in the more volatile strategies. about SPAC warrants–they are undervalued by Black-Scholes model. Tilson also holds some of the warrants. But I would be cautious. but city of london will lose money if GCH merge into JFC at the currently offered terms because of the 5% difference in discount, don’t they? I haven’t read the T&C but if a multi-billion investment fund has a 40% stake and they propose a merger, I’m quite sure the terms will be favorable to them. “City of London believes that, as part of the proposed merger, JF China Region Fund, Inc. would acquire the shares of The Greater China Fund, Inc. in a NAV-for-NAV swap, and understands that the merger would be followed by a 50% tender offer of the shares of the combined entity at close to NAV. So they would merge and then the combined fund would do a tender offer for 50% of the fund. Both parties would profit. the news was dated a year ago. You are correct, but I don’t see how that is relevant. COL refers to it again in their latest SC 13D/A. Maybe I understand you incorrectly, but both parties will profit in a NAV for NAV swap, regardless of what the current discount is in both funds (only important is at which discount they entered their position). Feel free to point me at my mistakes. if the swap is nav-nav, the holders of the fund with smaller discount lose money. imagine that both fund has nav of 10, then the swap is 1:1, but JFC trades at 6, and GCH trades at 9. Then basically GCH holders pay 9 to get 6, and they are worse off. If they are worse off depends on what the discount is going to be after the merger and how big % wise of the position can redeemed for a price close to NAV. If they do a tender offer for 50% of the shares it’s likely that they will be able to redeem almost their whole position for NAV and it doesn’t matter what the discount differenec is pre merger and post merger. You also need to include in the math that the discount of GCH is at the moment only small because there is a high probability of a liquidity event, such as a merger with JFC. If GHC would for example not merge but do a 50% tender offer on it’s own it would be probable that after the completion of the tender offer the discount of GHC would grow and would be comparable to that of JFC.